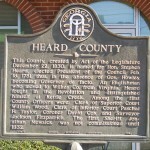 We currently have 4 historic markers in Heard County. 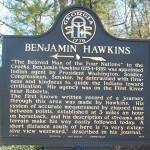 “The Beloved Man of the Four Nations” to the Creeks, Benjamin Hawkins (1754-1816) was appointed Indian Agent by President Washington. Soldier, Congressman, Senator, he determined with firmness and kindness to guide the Indians toward Civilization. His agency was on the Flint River near Roberta. The first known written record of a journey through this area was made by Hawkins. His system of accurate measurement by elapsed time between points, established at 3 miles an hour on horseback, and his description of streams and terrain make his way easily followed today. A short distance south of here is “a very extensive view westward,” described in his journal. This monument is located in front of the new Franklin Community Center located at the juncture of US 27 and Ga Hwy 34. This County, created by an Act of the Legislature December 22, 1830, is names for Hon. Stephen Heard, elected President of the Council Feb. 18, 1781, thus, in the absence of Gov. Howley, becoming Governor de facto. An Englishman who moved to Wilkes Co. from Virginia, Heard fought in the Revolution and distinguished himself at Kettle Creek. Among the first County Officers were: Clerk of Superior Court William Wood, Clerk of Inferior Court Paschal H. Taylor, Coroner David Cox, and Surveyor Jackson Fitzpatrick. The first Sheriff, Jonathan Mewsick, was not commissioned until 1832. This marker stands in front of the Heard County Courthouse. 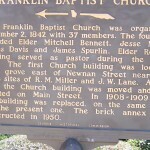 The Frankiln Baptist Church was organized December 2, 1842 with 37 members. The founders included Elder Mitchell Bennett, Jesse Moon, James Davis, and James Spurlin. Elder Robert Fleming Served as pastor during the first year. The first Church building was located in a grove east of Newnan Street near the home sites of R. M. Miller and J. W. Lane. About 1885 the Church building was moved and re-erected on Main Street. In 1908-1909 the old building was replaced, on the same site, by the present one. This marker stands in front of the Franklin Baptist Church on Main Street. 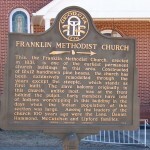 This, the Franklin Methodist Church, erected in 1831, is one of the earliest permanent church buildings in this area. Constructed of 12×12 handhewn pine beams, the church has been extensively remodeled through the years except the steeple, which stands as first built. The slave balcony originally in this church, unlike most, was at the front behind the pulpit. Early members have told of Indians worshipping in this building in the days when the Indian population of this section was large. Among the leaders of the church 100 years ago were the Lane, Daniel, Hammond, McCutchen and Lipford families. This marker stands in front of Franklin Methodist Church on Main Street.